Tel Branora is perhaps the southernmost town in Vvardenfell, on an island far to the southeast. It is the wizard tower of Mistress Therana, possibly the most eccentric (some say irrational) of the Telvanni Mage Lords. 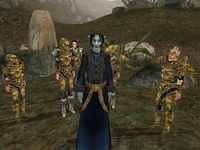 Because Therana is certainly eccentric, perhaps unbalanced, the Telvanni code would generally see her disposed of, unless she was capable of adequately defending herself. However, she obviously held great importance to the Council, or she would not exist as a Master. The tower itself does have some exceptionally good magical services, spells and equipment for sale. The continued operation of Tel Branora probably is more a tribute to the people around Mistress Therana than to Therana herself. Therana's Chamber houses Felen Maryon who is the exclusive provider of the spell Summon Golden Saint, and an alchemist who has a grandmaster's mortar and pestle. The docks are a short walk from the tower and surrounding community. There are a few hovels near the docks themselves, but the main community is up at the tower. The Tower Dungeon may be accessed only through the Lower Tower. Although the loot here is good (armor, gold, weapons), a few tough enemies are also on the scene. Fight them or use Chameleon/Invisibility spells and potions instead. Note that upon entering you will be almost immediately attacked by the Leveled Undead. The town itself has a smith and Sethan's Tradehouse with beds and a random glass weapon in the basement. Barnand Erelie offers some training here. The first shop on your right is Fadase Selvayn who offers household wares, projectiles, a Telvanni cephalopod helm and soul gems up to greater quality. Mistress Therana in her chamber in the tower is a quest giver. Seryne Relas is a master trainer of Alteration, located in her house at the northeast end of town. 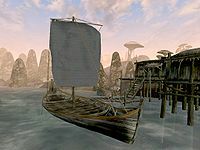 It is easily reached by ship from Ebonheart, Vivec, Molag Mar or Sadrith Mora. Reaching it by other means requires a long walk south from Molag Mar, followed by a long swim. From anywhere else, the swim gets much longer. Unless you are in the area for other reasons, plan to sail. Female characters who help Maurrie Aurmine find love will be directed to speak to Barnand. The head of the Telvanni guard, Mollimo of Cloudrest, wants you to discreetly take care of a problem, Telvanni style. Abebaal Egg Mine is found on the northern coast of the island north from the docks. Marvani Ancestral Tomb is located on the southern coast of the island directly northwest of the docks. The Velothi tower of Mawia is a couple of islands north of the main tower. The Prelude Shipwreck is located on the third island west-northwest of the docks. A Bounty for Trerayna Dalen: Aid Councilor Therana by killing Trerayna Dalen and her gang outside.